Sadly no one in his family is compatible but we hope with you help to identify the one donor whose contribution will be lifesaving. A donor is now needed in a matter of weeks though the registry of bone marrow donors is very small in Hong Kong. We, his friends and family, are trying to get as many Caucasian as possible to register in any centre of the Red Cross in Hong Kong before 30 June 2012 to give this man the best possible chance. It only takes one person to make all the difference. 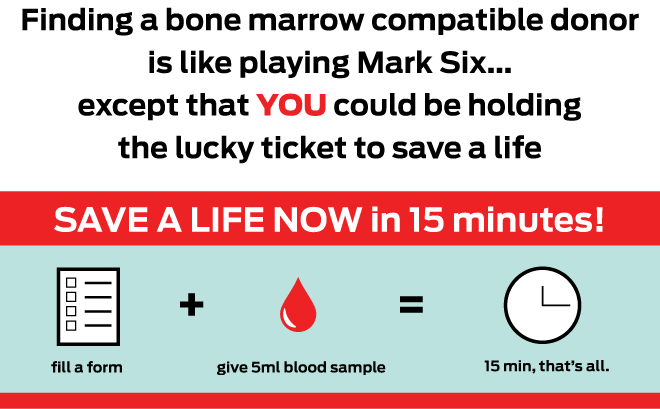 We need more people - a lot more people - to register at the Red Cross' Hong Kong Bone Marrow Registry. All patients will stand a better chance. 3 - Join our Facebook event, click "Join" then "Invite your friends"